Donald Duck is a famous cartoon character created by Walt Disney. It can be easily recognized by its sailor cap, sailor shirt and a red bow tie. This character has orange bills and legs. It appeared in animated shorts, comic books, and newspaper comic strips. Its full name is Donald Fauntleroy Duck. The first ever film in which Donald appeared was ‘The Wise Little Hen’. This film was released on June 9, 1934. Donald and Daisy Duck are one of the most beloved couple of Disney world. 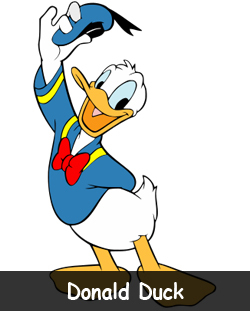 Donald’s voice is one of the most recognizable voices of all cartoon characters. Donald Duck’s father is Quackmore Duck and mother is Hortense McDuck. He also has a twin sister called Della Thelma Duck. In a late 40’s cartoon, it was revealed that Donald Duck has his birthday on March 13, 1914. Donald has got his first starring role in the 1937 short Don Donald. He was also starred in a series of shorts during World War II which made him a wartime screen star. He has appeared in a total of seven animated features which is more than any other cartoon character. Clarence Nash was Donald’s voice from June 9, 1934 up until 1983. From 1985 it was Tony Anselmo. Donald also has a star on the Hollywood Boulevard Walk of Fame. Donald’s license plate number is 313 which is meant to indicate that he is very unlucky. Donald Duck is believed to be partially color-blind. It is the only popular film and TV cartoon character to appear as a mascot for the sports team of a major American university. Declan, Tobin. " Facts for Kids about Donald Duck Facts ." Easy Science for Kids, Apr 2019. Web. 23 Apr 2019. < https://easyscienceforkids.com/donald-duck-facts/ >.